White Label Space: How does your team rate? A GOOD wrap today on Ars Technica on where the GLXP is at three years in, following the December 31 deadline closure for new registrations. 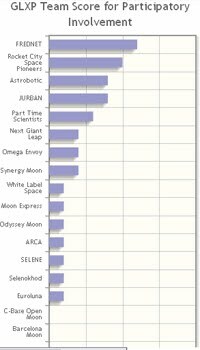 The report - Fly Me to the Moon: The Google Lunar X Prize Three Years In - includes a refresher on what it's all about, how Google's working to keep interest high in the competition and a link to an interesting blog which attempts to keep a running tally on how each team is faring. Hosted by Mike Doornbos at evadot.com, who admits it's "completely unscientific", it nevertheless is updated regularly (the last update came just two days ago) and is based, he claims, on "knowledge from interviews, in person accounts, and publicly available information". As well as overall chances of winning, teams are ranked in nine other categories such as Feeling, Participatory Involvement, Inspiration and Rover/Hopper. Mike also includes a breakdown of where points can be scored. Check it out at evadot.com/glxpscorecard/if only for an idea on how we're faring from the point-of-view of someone looking in. He also keeps a pretty nifty blog at http://michaeldoornbos.com/with plenty of GLXP and other space news as well. Worth a look. Over at space.com, they've started a week-long series about returning to the Moon, starting today with The Case For, which also includes this link to an excellent article last year about why lunar mining should be an irresistible private enterprise proposition. Tomorrow's post - The Case Against - should be equally intriguing.